Reading and share top 4 famous quotes and sayings about Existential Existence by famous authors and people. Browse top 4 famous quotes and sayings about Existential Existence by most favorite authors. 1. 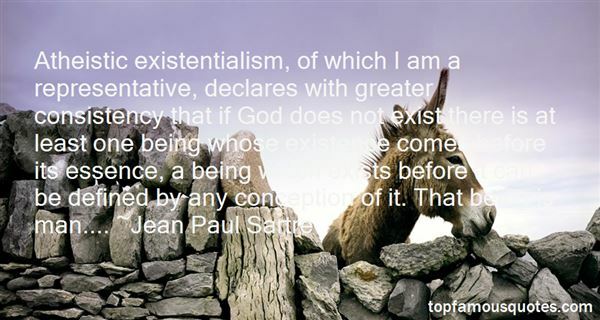 "Atheistic existentialism, of which I am a representative, declares with greater consistency that if God does not exist there is at least one being whose existence comes before its essence, a being which exists before it can be defined by any conception of it. That being is man...."
2. 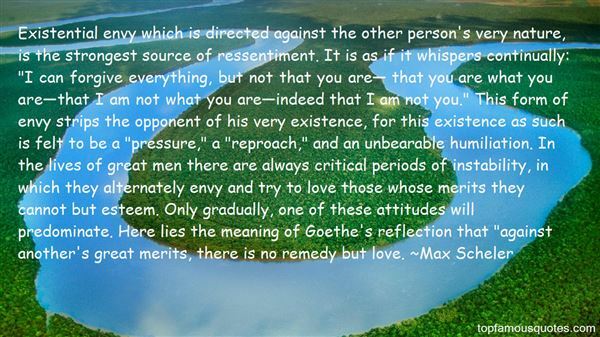 "Existential envy which is directed against the other person's very nature, is the strongest source of ressentiment. It is as if it whispers continually: "I can forgive everything, but not that you are— that you are what you are—that I am not what you are—indeed that I am not you." This form of envy strips the opponent of his very existence, for this existence as such is felt to be a "pressure," a "reproach," and an unbearable humiliation. In the lives of great men there are always critical periods of instability, in which they alternately envy and try to love those whose merits they cannot but esteem. Only gradually, one of these attitudes will predominate. Here lies the meaning of Goethe's reflection that "against another's great merits, there is no remedy but love." 3. "The existential attitude is one of involvement in contrast to a merely theoretical or detached attitude. "Existential" in this sense can be defined as participating in a situation, especially a cognitive situation, with the whole of one's existence....There are realms of reality or—more exactly—of abstraction from reality in which the most complete detachment is the adequate cognitive approach. Everything which can be expressed in terms of quantitative measurement has this character. But it is most inadequate to apply the same approach to reality in its infinite concreteness. A self which has become a matter of calculation and management has ceased to be a self. It has become a thing. You must participate in a self in order to know what it is. But by participating you change it. In all existential knowledge both subject and object are transformed by the very act of knowing." 4. "Life is really very simple. In each moment, we have the opportunity to choose between saying "yes" or "no", to listen to our intuition, to listen to our true inner voice, the Existential voice within ourselves. When we say "yes", we have contact with Existence and we receive nourishment, love, joy, support and inspiration. When we say "no", we create a separation from life and begin to create dreams and expectations of how it should be. We begin to live in the memories of the past and in the fantasies of the future – as if any other time than here and now really could make us happy and satisfied." You can only fall in love once the next time you rise with it"